With summer officially here, I find myself skipping the straight scotch and bourbon on the rocks for more refreshing mixed drinks to pair with a cigar. 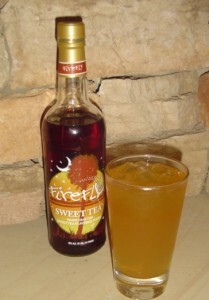 One such libation is the Firefly Spiked Palmer, made with Firefly Sweet Tea Vodka. Firefly is a unique drink that is taking the Southeast by storm. Made on Wadmalaw Island, 30 miles south of Charleston in South Carolina, it is distilled four times and infused with tea from a plantation only a few miles from the distillery. Then, to get that distinctive sweet tea taste, they blend it with Louisiana sugar cane. The result is a vodka that tastes like a stiff sweet tea and packs a serious punch at 70 proof. That combination of flavor and strength makes it a great candidate for a mixed drink. Perhaps the simplest and most popular Firefly mixed drink is the Firefly Spiked Palmer, an alcoholic take on the classic Arnold Palmer. To make one, simply mix one part Firefly with one part lemonade over ice. I found that Newman’s Own Lemonade works well because it has just enough sweetness, but really any lemonade would probably get the job done. The result is a drink that tastes dangerously like just sweet tea with a spash of lemonade, meaning you could easily drink a few too many of these. As for cigars, you’ll need something to stand up to all that sweetness. I’ve found bold maduros, like the CAO Brazilia, Arganese ML3, or EO 601 “Blue”, do the trick. No matter what cigar you choose, I think you’ll enjoy changing things up a bit with the Firefly Spiked Palmer. While it’s a far cry from more traditional cigar pairings like scotch, bourbon, or cognac, it’s a refreshing change of pace during these warm summer months. I just got back from Myrtle Beach and bought myself a handle of this stuff for just $30. Well worth the purchase. Combine with either standard or pink lemonade and you have an awesome drink. I tried 2 parts vodka, 1 part lemonade last night. Delicious. I probably won't burn a cigar with this though. Maybe a cigar while mowing the lawn, followed by a Firefly Palmer to cleanse the palate. I can't smoke a fine stogie with a lemonade, neither a vodka. how ever if you're going for a refreshing glass hit the mojito. I have heard about Firefly from some customers at the shop… I guess I'll need to pick some up. I believe one told me Spec's carried it here in Texas.